This Is Our A Pair 52.5lbs Cast Iron Dumbbells Set, Which Is A Pair Of Brand New 105 Lbs (52.5 Lbs X 2pc) Adjustable Dumbbells Kit. Not Everyone Who's Interested In Getting A Better Body Through Strength Training Has The Necessary Room In Their Home For A Dozen Or More Sets Of Dumbbells, But In Order To Get The Best Results And Perform The Widest Variety Of Exercises You Need To Be Able To Use Implements Of Varying Weights. This Adjustable Dumbbell Kit Is The Best And Must Have For You! Do Not Hesitate, Buy A Set For Yourself. Note: 1. Please Warm Up Fully Before Training To Avoid Physical Injury. 2. 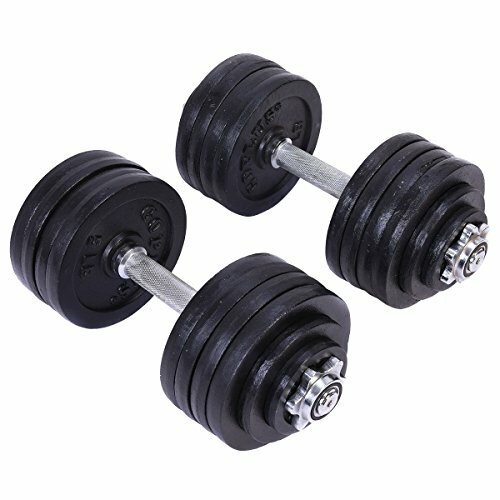 52.5 LB Dumbbell Set Comes With Weight Plates Set (5LB*8PCS,2.5LB*2PCS, 1.25LB*2PCS), One Rods And 2 Buckles. 3. Please Consider The Weight Limit Before Changing The Weight Plates Of Your Own. 4.There Are Two Packages Shipped. Please Ensure Two Packages Are Delivered Before Using.